Backpacks for Teenage Girls Reviews: How to buy the right one? Backpacks are not always a simple pick and choose, as there many features that can determine what is the best fit for you. Additionally, purchasing items for teenagers can be quite difficult as they can be picky, selective and generally unsure of exactly what they want. Regardless, there will be times that they will need a backpack and you will want to know which one you should choose. Picking a backpack for teenage girls is the same as any teenager; you have to discern the style more so than the intended use, as style has become a much more prominent feature in teenage society these days, at least it seems to be. How to pick the right backpack for teenage girls? Determine the purpose: First, you should determine what the intended use of the backpack is. Will the teenage girl be using it for high school, maybe even college? Are they going to take it with them on school camping trips or school in general or will it be used mainly outside of study? Durability: Purchasing a bag that only looks nice but does not have any durability will make it an instant fail. Durability and strength are important as there will most likely be times when the backpack will be full of books, clothes or any other assortment of goods. You want one that is tough, has strong zippers that won’t break when overloaded and can easily be picked up and carried when stuffed full of assorted goods. Comfort: Comfort is another key feature when selecting a backpack, as the person who is wearing it will be able to feel it, especially when it is full, bloated and heavy. Even the most rugged and durable backpacks are not given a second look if they are not comfortable. When it comes to selecting items that we as people use, comfort is perhaps one of the most important features. Investigate stuff such as the padding on the straps, or any point parts on the backpack that could possibly dig into the wearer. Any backpacks with these negative features are the ones to avoid, especially when selecting the bet backpack for teenage girls. 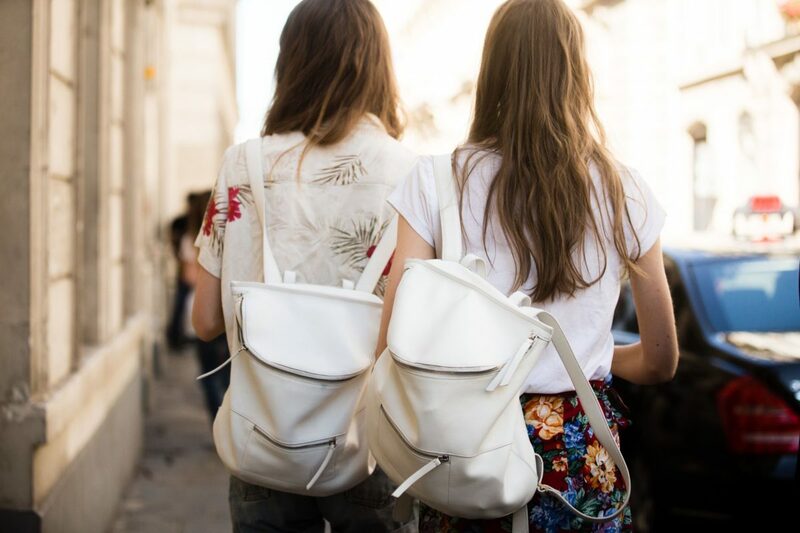 Design/Style: The design of the backpack is another make or break factor that most teenage girls will use to judge whether they want a backpack or not. Especially in school, style and design play an important role in development as well as acceptance within today’s social clichés. Teenagers have minds that need stimulation, which is helped by fun and exciting designs on everything that they use and see during this point of their development; you see it on clothes, stationary, food products and even backpacks. Thankfully, most backpack manufacturers already have this in mind, meaning that you won’t be short on designs that are pleasing to the eye, particularly for their target market of teenage girls. 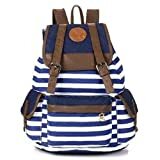 You will also want to determine what types of styles you want to purchase for the teenage girl in question, after all this backpack will be for them. It would be a waste to purchase a flower design backpack for a teenager who is more interested in sports and less so in flowers, despite the flower design being a relatively safe design to go with. You may even have a teenager who is very interested in rock music and prefers the grungy style of metal bands than sports or flowers. This is important to remember so that the backpack you purchase not only fills the criteria of being useful and durable but also the style criteria of the teenager. Which backpack for teenage girls should you choose? A simple design, this flowery patterned backpack has multiple pockets comfortable padding on the rear of the backpack and shoulder pads as well as a nylon fabric design to give it some durability. The design itself is enough to warrant its purchase for teenage girls as stated previously; flowery designs are cute and most teenage girls will enjoy them quite a bit. It is also large enough to carry enough books as well as a laptop, ensuring that it can be used efficiently. Reviewers state that they have given this backpack to teenagers and above, and that the quality of this one is above and beyond in its efficiency, durability and overall style. Overall it exceeds expectations and maintains the same high quality as is expected from the brand High Sierra. A small selection of reviewers has stated that they were some zipper problems, however. A cheaper alternative to the one mentioned previously, this design appeals more to the teenager who is looking for a stylish approach to their backpack agenda. The simplistic design of blue and white stripes draws attention to itself, for its mature appearance. The material is stated as high quality canvas the straps on top help to keep the contents firmly in place. Some reviewers state that the bag is the perfect size for use at school and has more than enough space to carry all your books and folders, although one does suggest that there may be a lapse in quality as theirs created a noticeable rip in the material only a month after purchasing. Different in style to either of the previously shown backpacks, this one would appeals as the best backpack for teenage girls who are not as interested in flowers and horses as they are rock bands and a slightly darker side of life. That is not to say there is anything wrong with that, the variety of backpacks available caters to all audiences. Is Metal Mulisha is created with 100% polyester, has a unique pattern and design on it and is also big enough to carry all the require books and folders for school. Reviewers have stated that they love the design and it does all their want with regards to their study arrangements and general-purpose use. Regardless of your thoughts on the best backpacks for teenage girls it is undisputable that there are a number of factors that clearly need to be considered before making a purchase. With the large range of styles, designs and differently created backpacks it will be an easy task finding one, the hard part is figuring out what that teenager wants to begin with.